It’s crazy to have two posts in one week featuring myself on a video. I have not been videotaped in forever and ever until this week. (Is “videotaped” still the proper word?) The first video on Fox 26 News showed me making a ridiculous amount of boxes and the second video below involved me shoving to the side of the room a ridiculous amount of boxes so that the webcam wouldn’t see them. 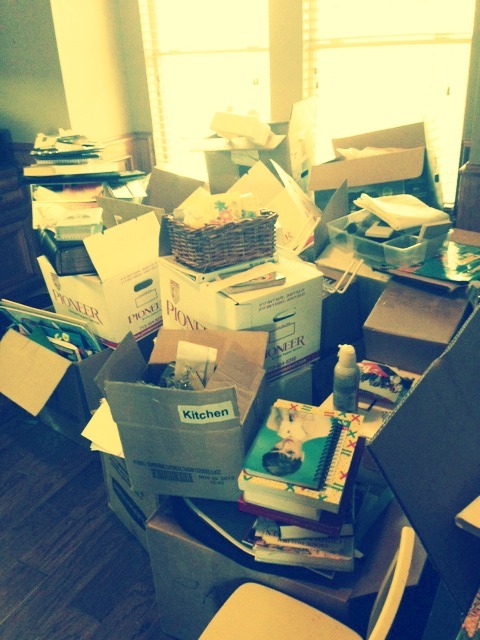 We moved into this house just a few months ago and the study is the last room to unpack. 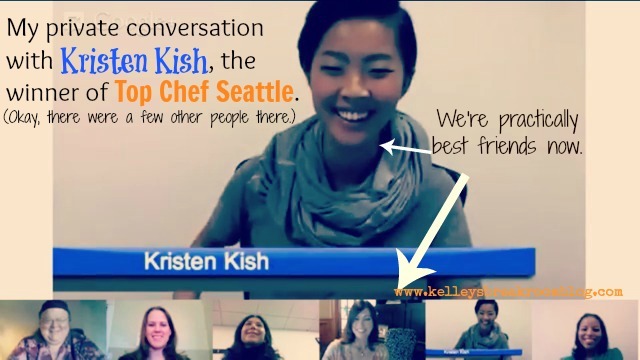 All of that shoving and sweating and carrying was worth it to interview Kristen Kish, the winner of Top Chef Seattle, along with Cara from Allie Is Wired, Bridgette of Lez Get Real, Courtney, a representative from Bravo, and the Social Chorus director of the Top Chef program, Jhanell Biggs. This was due to my interaction with Top Chef this past season as a part of a their “A-Lister’s Program”. You can see all of my Top Chef related posts here. It was well worth it. Kristen is super nice and obviously very smart. It was a privilege to be able to talk with her. *When Cara asked her who her biggest competition would be if there was a Top Chef competition among the 10 winners, she said Richard Blaise and Michael Voltaggio. She went on to say that any of them would be stiff competition due to the fact that they all had won by going through many difficult challenges. *Bridgette asked her how being adopted influenced her life and drive her passion for culinary artistry. Kristen said she wasn’t sure there was a direct correlation, but that she has always felt she had a drive and a push to prove herself. She shared that this may stem from her being adopted and “feeling unwanted”, possibly. She looks forward to her trip to Korea very much. She was born in Seoul. *Her earliest memory of cooking was when she was 5-years-old. She would watch chefs cook on the Discovery Channel and would “cook” at the same time in her kitchen. She decided to make chocolate pudding one day, but had no chocolate. As most cooks would do, she used soy sauce to make it brown and then stuck it in her refrigerator. Her dad came home from work and ate some. Ha! I love that story big time. I told Kristen that I would be making her Soy Sauce Pudding last night. *I asked Kristen (thanks to one of my readers and former neighbor, Laura!) what her go-to comfort meal was at home, given that she leans toward the classics and is classically trained. Kristen said that she NEVER cooks at home! Isn’t that craziness? She says she goes out to eat all the time- 5 to 6 nights a week. She orders take-out and likes to eat chicken fingers, pizza, hamburgers and fries because they’re quick and “satisfying”. She eats hamburgers! And chicken fingers! Unbelievable. *She said the driving force to be a great chef has to be passion. She is passionate about what she does and, if she weren’t, it would make it very difficult for her to make the sacrifices she must make. She often has to miss holidays, important events with friends and family, etc. due to her busy schedule, which has just increased a million-fold given her new stardom! Seriously, the interview was lots of fun and I am grateful for the opportunity to have talked with her videotaped face to videotaped face.